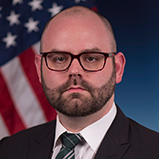 Dr. Tom Rondeau joined DARPA as a program manager in the Microsystems Technology Office in May 2016. His research interests include adaptive and reconfigurable radios, improving the development cycle for new signal-processing techniques, and creating general purpose electromagnetic systems. Prior to joining DARPA, Dr. Rondeau was the maintainer and lead developer of the GNU Radio project and a consultant on signal processing and wireless communications. He worked as a visiting researcher with the University of Pennsylvania and as an Adjunct with the IDA Center for Communications Research in Princeton, NJ. In these roles, he helped push forward architectures and algorithms in signal processing for communications, signal analysis, and spectrum monitoring and usage. Dr. Rondeau is active in many conferences and workshops around the world to help further research and technology in these areas, and he has consulted with many companies and government organizations on new techniques in wireless signal processing. He has published widely in the fields of wireless communications, software radio, and cognitive radio. Dr. Rondeau holds a Ph.D. in electrical engineering from Virginia Tech and won the 2007 Outstanding Dissertation Award in math, science, and engineering from the Council of Graduate Schools for his work in artificial intelligence in wireless communications. Check out the incredible speaker line-up to see who will be joining Dr. Tom.